LOCATION . . . Approximately 5 minutes/miles from the West Entrance to Yosemite National Park just off Highway 120 at 3,800 foot elevation, and about 20 miles to the charming Gold Rush town of Groveland. The cabin is actually located on the historic Big Oak Flat Road into Yosemite National Park which was used by those traveling from the San Francisco Bay Area. Decades ago, the owner of the property in this area actually installed a number of gates along this road in an attempt to inconvenience and discourage those venturing into Yosemite. Obviously, today he is no longer a factor, and people are no longer discouraged from enjoying this beautiful national treasure. YOSEMITE RIVER CABIN . . . A beautiful retreat, honeymoon getaway for two or more, nature vacation, and fabulous family recreation experience. THE RIVER . 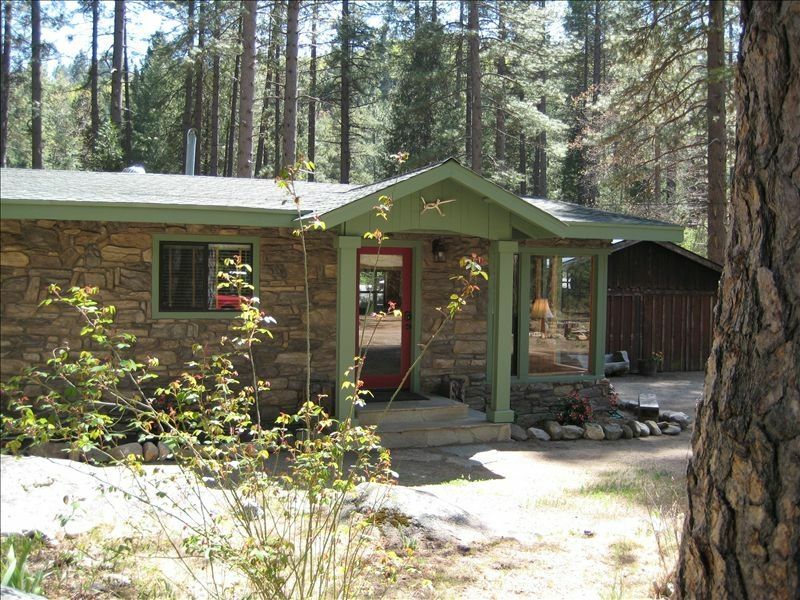 . . Yosemite River Cabin is situated on nearly 1.25 acres, mostly flat, with beautiful pines, dogwood and cedar. In the evening you'll enjoy moon rises over your back yard. If you arrive in the vicinity of a full moon, you may enjoy a mystical experience from your rear porch. Sip wine on the porch and relax to river sounds and the sounds of the forest while enjoying one of the good books provided, or stroll a hundred feet or so to the river's edge for soothing moments of relaxation and beauty. Your cabin has over three hundred feet of river frontage at the back and to the right of the property. It is located on the South Fork of the Tuolumne River right at the confluence where Big Creek flows into the Tuolumne from its opposite bank. NATURE IS ABUNDANT . . . We've noticed when we are in the San Francisco Area where we maintain our other home, we no longer smell fragrances or see wildlife that is as abundant as at Yosemite National Park and Yosemite River Cabin. In nature fragrances and wildlife are plentiful. At the Yosemite River Cabin we have seen swarms of ladybugs, beautiful butterflies (including Blue Dots), fish in the river, lizards, foxes up the road (but so far not on the property), deer (regularly in the area), and a bobcat once. We've even seen a couple bears a few miles away inside the park at Crane Flat, a very common place to view bear we're told. (Crane Flat is also a convenient destination for cross country skiing in Winter.) Yosemite River Cabin is truly a place to see and experience sites uncommon to our daily lives. THE PROPERTY . . . Nearly level, the property provides plenty of room for play or relaxation. Enjoy a barbeque, relax in the sun, play in the snow (from time to time in the Winter), or hike and experience nature along one of the many nearby trails. Located within a mile of Yosemite River Cabin at Highway 120 is a general store, which provides some food service and which is a handy place for extra supplies, charcoal, maps, gas, chains in Winter, and souvenirs. YOSEMITE RIVER CABIN ACCOMMODATIONS . . . Your cabin is fully equipped with a full kitchen, including granite counters, farm house sink, gas range and oven, microwave, dishwasher, disposal and refrigerator. Pots, pans, utensils, glasses, teapot, coffee maker, toaster and much more are provided. The living area includes a dining table with back yard view, living room with leather sofa, leather chair, flat screen HDTV for DVD movies or CD music. Over 100 movies are provided, numerous board games and two or three dozen books, including some great history on the area. Also, available is wireless Internet access if needed. In addition, you'll find on the wall in the hall a government topographic map of the section to familiarize yourself with the area. Each room has a unique designer ceiling fan as well as it's own distinct character. In the living room you will find a propane gas stove which thermostatically controls cabin temperature. Out your back door is a raised porch with a view of the yard and the forest that is perfect for enjoying a glass of wine or juice and taking in the beauty of your surroundings. Indian arrowheads have been found on the property, and Indian grinding and birthing stones are in the immediate area. SLEEPING ARRANGEMENTS . . . Yosemite River Cabin includes three bedrooms. Bedroom One has a queen bed, Bedroom Two also has a queen, and Bedroom Three now has a double bed. We believe this cabin is ideal for up to 6 persons. Rooms have armoires and chests for clothing and storage. RESTAURANTS IN AREA . . . Within a few minutes are two very good restaurants. Evergreen Lodge on Evergreen Road is our nearby favorite with a wide range of exceptional offerings. They also provide a nice selection of wines to accompany your meal and from time to time provide live music and popular music festivals on their grounds. A second nearby choice, the new Rush Creek Lodge Restaurant, is located even closer to us, just 4 miles up the highway. A sister property to Evergreen Lodge, with a more 'bistro style' menu has a bar adjoining, is a nice place for a quick 'night on the town', and just a mile from Yosemite. A RULE OR TWO: This charming smoke-free cabin has been extensively remodeled in luxurious fashion. It is a no smoking, no pets facility. If you smoke inside or bring a pet, you will forfeit your entire deposit. Please understand, this is for the continued comfort of all our guests. Thank you for your understanding. VISIT OUR MAIN WEB SITE FOR MORE INFO, PHOTOS AND TO BOOK ON-LINE, IN THE LINKS SECTION BELOW. Land line for local calls. Cell reception spotty, but is available in nearby areas. This picturesque cabin is dramatically remodeled with granite kitchen counters, under cabinet lighting, farmhouse sink, gas kitchen range, and microwave, new refrigerator, dishwasher, disposal, washer & dryer, ceiling fans, tile floors, new full bath, and beautiful stone exterior. Wood style propane parlor stove (looks like wood stove). Yosemite River Cabin is thoroughly redone in luxurious fashion throughout. Well stocked with everything you need, clean and cozy, perfect for our party of 3 kids and 3 adults. Very close to park entrance and lots of outdoorsy things to do nearby. We loved it. nice place quiet and clean. Would definitely return. great little place, nice surroundings. Very well maintained property, feels like you're visiting someone's home, not a rental! Stayed in the winter, was nice and warm. Would definitely stay again. About an hour to the valley floor, so a bit of a drive, though very close to the park gate. Great location, all the amenities, clean and well stocked. Would definitely stay again! Nightly rates are based on up to 4 guests. Add an additional $25 per night for each additional guest. Children under 3 are free! Please state the ages of any children. Thank you! A security deposit of $250 is required. Guests are expected to leave the cabin in generally the same condition as they found it. Deposit will be refunded following checkout, upon clean inspection. Thank you! Vacationing guests may not want to wash their dishes, after all, you are on vacation! If so, upon checkout you may leave them, along with an extra $20, and the housekeeper will take care of it for you.